We started our adventure on October 10th in Grand Rapids at the Double Tree and ended on October 30th in Mount Pleasant at the Comfort Inn & Conference Center. Through that four week period we traveled a total of 1,365 miles, covering most of the Lower Peninsula. Yes, all of the travel took a toll on our bodies, but it was totally worth it. We might’ve gone down a few dirt roads (literally) but we made it to each destination safe and sound. Our main purpose to attending these events was to educate township officials about the many different services/products we offer. Their interest was piqued by the wide variety of tech products we provide. With the importance of a good website in this day and age many attendees were intrigued by the fully customizable websites we create. A website catered to the client’s needs is what we pride ourselves on. Educating the audience with our document management service was also a success. Promoting a paperless office is not only environmentally friendly, but it saves hours of searching through filing cabinets to find certain files. Finally, our mobile app that is soon to launch provides a platform for citizens to fill out simple forms and push notifications. Communication between the township and its citizens is made virtually seamless, resulting in less phone calls and travel to the Township Hall. Providing web development, document management and nearing the launch of our municipal app, the “MTA On The Road” events were the perfect places to display our brand. We truly educated the many who attended on the products we offer to help them run more efficiently, with the help of food as an incentive to lure them in. The one common theme amongst all of the events was love for the many snacks we provided. We were for sure the “Kings of Snacks” during these events. One thing that’s for certain is that STG loves to treat its attendees. With the limited car space, we were unable to transport our ever so popular popcorn machine. No worries though, we made up for it with variety of snacks such as Gardetto’s, animal crackers, pretzels, a variety of cookies, jelly beans (with 41 different flavors! ), and of course mini water bottles to wash it all down. We are lucky we are in the tech industry because we all know we wouldn’t make it in the health industry. We met so many great people during the month of October, some of whom resulted in great leads. 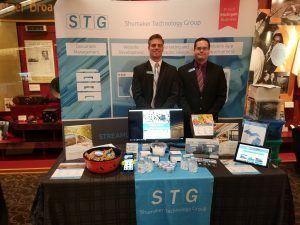 With the number of municipalities STG serves, it was important for us to make an appearance at each event to show the dedication we feel is necessary to be a product and service provider. We encourage any small business to attend The “MTA On The Road” events because of the recognition all of the businesses receive. The Michigan Townships Association, as usual, put on a great conference that was filled with useful information for everyone involved. We would like to thank the MTA and all of its attendees for their support. We cannot wait until next year’s, and we hope to see you all in the near future!